As we were heading into the VIP entrance at The Kansas City Royals home opener on Monday we barely had time to get our camera out as none other that Sir Elton John himself and his entourage of about 15 people were heading to their private box. We were fortunate to catch him at all as he was quickly whisked off from his car service into the K.
Shown here wearing this Royals cap, Elton was ready to watch the Royals take on the Minnesota Twins in a great home opener for 2013 in which the Royals bested the Twins 3-1. It is not known whether or not Elton John stayed for the entire game, although usually when celebrities this large come to events they wait until the crowd dissipates before attempting to get them back into their car service. 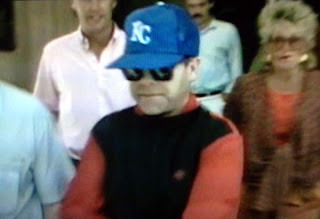 It was great to see Elton John in a Kansas City Royals hat, hopefully that will be some kind of a sign of good luck for this season. If anyone else was able to nab a photo of Elton John coming into or leaving the game, please email them to us. Our photographer had her camera packed away as we hadn't planned on taking any photos until the opening ceremony began, and BAM! - here comes Elton John. So, before we could get our good cameras out, our only resort was to snap a good old iPhone shot which you see here. It was without a doubt Sir Elton, however and security around him was tight. The Kansas City Royals will face the Twins two more times before ending the week playing The Blue Jays - and Elton John, who just came from Baton Rouge, Louisiana, will head to Las Vegas to begin a string of performances at Caesar's Palace that starts on April 20th. Elton John at Royals home opener 2013 by KCMB Kansas City News, official kc news site with breaking stories on The Kansas City Royals, Chiefs, charity events, the 2012 MLB All Star Game, weather, sports, MU, KU, ufo sightings, dui checkpoints, Kansas City neighborhoods, nightlife, concerts, the Sprint Center, the Power and Light District and current Kansas City news articles.